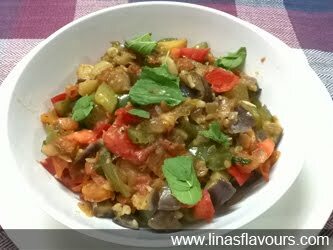 Ratatouille is a French side dish, but is also served as a complete meal in lunch or dinner. Add brinjal and cucumber and cook till it is half done. Add bell pepper, cayenne pepper, salt, black pepper, oregano and cook for 5-7 more minutes. Add tomatoes, half basil leaves and cook for 2-3 minutes more. Garnish it with remaining basil leaves and serve it immediately. You can even sprinkle grated cheese before serving.